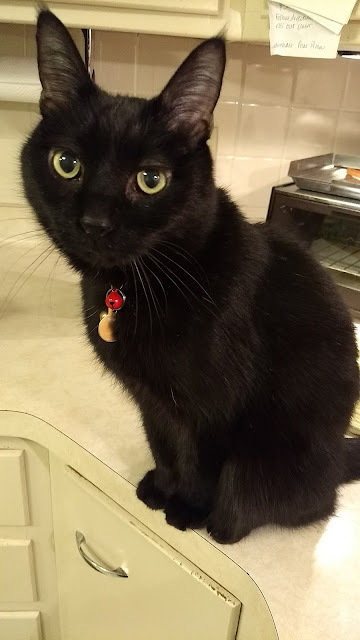 Cats have been associated with superstitions for a long time and don't even get me started on the discrimination against black cats! This prejudice against cats was propagated by a real jerk named Pope Gregory IX (Pope from 1227 to 1241) and resulted in dire consequences! It is thought that the Black Plague (1346-1353) was spread by infected fleas on rats and rat droppings in the grain supply. At the time they didn't know that this was the case. 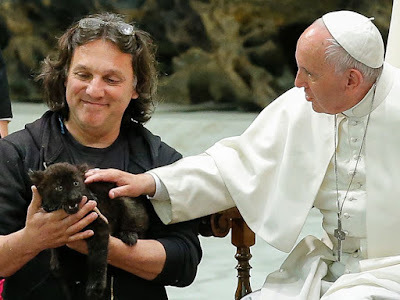 The pope banned cats years beforehand ~ bad move on his part. He was in his 80s ~ pretty old to be a pope. He was once a lawyer, and a fan of making bold proclamations. He's even responsible for the Papal Inquisition! So on a power trip, he wrote the Vox in Rama. It was an attempt to control demonic activity and claimed that black cats are instruments in devil worship. Cats became a symbol of heresy and his decree put a target on all of them. Killing animals made by God?! What?! This is NOT so holy Mr. Pope! Bad Pope Gregory IX! Vicktor might be evil, but I swear he's only the tiniest bit evil. My Ginger Rogers is the fiercest hunter there is. She can see a bird from a mile away, but put a piece of cheese in front of her and she has no idea it's there. She often hunts in our house. Eating, killing, and maiming spiders, lady bugs, and I even caught her with a wasp in her mouth. She ate it ~ no mercy. If she were an outdoor cat the first thing she would hunt is birds, then she'd go after our neighbor's outdoor cat Dewey. She can't stand him. I'm not really sure why. Cats will prey on rabbits, snakes, bugs etc. if given the chance...even rats. Ginger doesn't sleep, she waits. Large numbers of cats and their owners were accused of witchcraft and killed leading up to the Black Plague. Many of the people killed were single peasant women that kept cats for companionship. They were merely scapegoats. As a result, the cat population went down and the rat population went up. No cats to keep the rat population in check. ugh oh. And if there's no cats to kill the rats, the spread of disease and death comes easy. People paid dearly and it decimated the population in Europe killing 25 million! Moral of the story don't mess with cats, they'll curse your people. Good thing our new Pope Francis isn't a jerk. Here he is petting a baby black panther. Wet & Wild's Goth-O-Graphic Makeup! Fluffy's First Birthday...oh and a Giveaway!